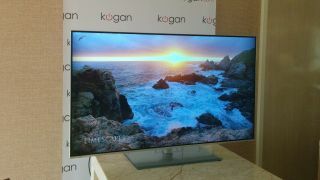 First shown off at CES earlier this year, Kogan has finally announced that it's new sub-$1,000 4K smart TV is finally on sale in Australia. With just a $999 price tag, you'll get a 3D-ready, 55-inch 4K LED display. It can also upscale Blu-ray and DVD content. The smart TV has PVR functionality and runs Android 4.2 with access to Google Play. It doesn't lack in connectivity either, packing in four HDMI ports, Wi-Fi and Ethernet ports, a USB 3.0 and three USB 2.0 ports, as well as a microSD slot. The 55inch Agora 4K Smart 3D LED TV (Ultra HD), as it's known on Kogan's website, is on presale now, but while the TV will cost you only $999, you'll also need to account for delivery costs. And as it only comes with only one pair of 3D, you'll likely want to grab another, which will set you back another $49 from Kogan. TCL last month announced that it was also bringing budget 4K TVs to Australia, but it's 55-incher was still about double Kogan's offering at $1,999. Even TCL's 50-inch model isn't able to break the $1,000, coming in at $1,299, and even with delivery costs and buying an extra pair of 3D glasses, Kogan's offering still comes out cheaper. But whether you're willing to lay down hard cash for a budget 4K TV is another matter altogether.